Are you looking for an activity to motivate and inspire your team with enthusiasm and energy that are so hard to find these days? Are you looking for an activity that stimulates both competitiveness and collaboration in a way that is innovative and refreshing? 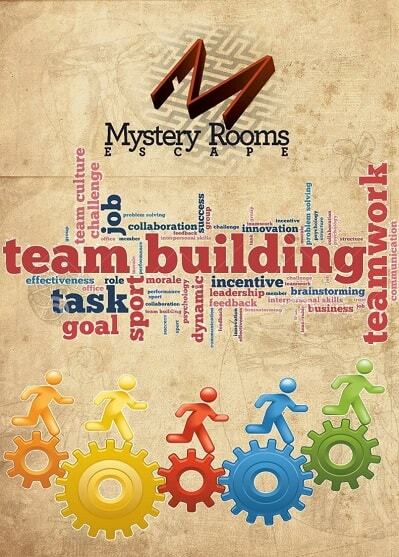 Then choose a teambuilding at Mystery Rooms Escape Bucharest! ESCAPE ROOM games are perfect for stimulating out of the box thinking and creativity, and are very suitable for a teambuilding. Usefulness combines with pleasure in a harmonious way, the games contribute to the development of team spirit and the coming into being of that "chemistry" of a group, which is so beneficial in both personal and professional life. The team’s strength grows, communication flourishes, all that happening in an environment of involvement and fun. What better way to understand and develop a team, if not taking part in a fun and fascinating group activity that involves problem solving and advancing to a final goal shared by all members? At the same time, group links, engagement, assumptions, and role reversals are perfectly observable in an escape room experience, and important competencies such as time management, planning and leadership come to light during the game. Choose intelligent fun and enter an escape room adventure. We will be waiting for you and your team at Mystery Rooms Escape! Or we can come to your place! For groups of 20-160 people, we have the game ready for 2-3 hours of fun in any location chosen by you, indoor or outdoor! Mystery Rooms Escape Bucharest has positioned itself from the beginning, almost two years ago, as the largest location in the country and has kept this position with a capacity of 46 players, playing simultaneously, operating often at full capacity even consecutively, as in having half an hour or less between groups, with experienced employees and considerable "training" in managing such large groups under the pressure of time. Our portfolio of collaborations is quite extensive, some of the names being: Oracle, Renault, Vodafone, Emag, Loreal, UPC, Interbrands, Orange, Google, Unicredit, Telekom, Provident, Heidi, Socgen, Misys, Radissonblu, Michelin, Mavenhut, CGS, Huawey, Mega Image, and many others. For some of these, we even had the pleasure of delighting entire senior management teams and even board members. The record of events held outside our locations is owned by the preparation, alongside Mystery Rooms Escape Brasov, of a complex and interdependent game for 16 teams totalling 160 people. To sum it up, we are good, professional and we are proud of it! In any teambuilding, a treasure hunt like activity organised by Mystery Rooms Escape, possibly personalised according to the location or your preferences, is going to be the bread and butter of maximum fun and the secret ingredient to an unforgettable memory, which will be told and remembered for a long time. You can trust us; we speak from experience. Quality Escape Room games are the best teambuilding activities in the world!